Ever since DC Comics did their Rebirth launch two years ago, they have been putting out amazing stories. Justice League #3 from Scott Snyder and Jorge Jimenez is no exception. 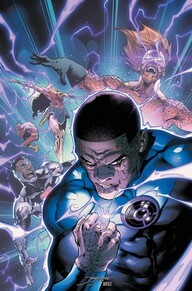 The main story of Justice League #3 focuses on John Stewart and his struggle with being an Ultraviolet Lantern. It turns out the emotion of Ultraviolet is violence and it opens up a brand new invisible emotional spectrum that draws its power from the “still force.” Meanwhile, Batman and Hawkgirl have been shrunk to the size of an atom so they can combat a new from of cosmic bacteria that is attacking Superman and Martian Manhunter. There is a lot to juggle here but it comes together in an amazing reveal at the very end of the book. The story from Scott Snyder in this issue is fantastic. Snyder shows that he has a grasp on every character in the series and does them so much justice (pun intended). He has also shown that he is an amazing world builder with taken what writers like Geoff Johns has built over time and not only run with it but turned it upside down. This is an action packed story yes, but it is one that makes you think so much. Snyder also starts to set up the endgame of the story arc in such a unique and interesting way. Jorge Jimenez proves that he is still one of the best artists working comics today. His art is fantastic and fits the tone of the series so well. The detail in every panel is something to behold and every character looks great. John Stewart as an Ultraviolet Lantern looks great and the costume is as simple as his Green Lantern costume. Seeing the violence and rage on his face helps bring the emotions of the story out even more. I can’t say enough about the art. 5 Ultraviolet Lanterns out of 5.